Another video game cover art saved from the inexorable flow of time, now it is the turn of Driller, or Space Station Oblivion as it was marketed in the United States, a 3D first person shooter with strong characteristics of action and adventure, developed and published in 1987 by the British software house Incentive. This game used for the first time the new Freescape rendering engine, which was implemented for Commodore 64, Commodore Amiga, Amstrad CPC, Atari ST, ZX Spectrum and IBM PC. The game is set on one of the two moons of Evath, a planet inhabited by a human colony, called Mitral. This moon was literally devoured by the settlers’ mines and, having become unstable, threatens to destroy the main planet due to the presence of a huge amount of gas, ready to explode after the collapse. 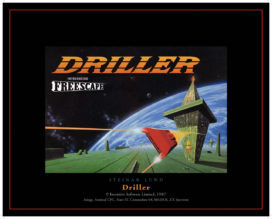 The protagonist of the game must therefore, alone and against the various automatic defense systems left active, must place a drilling rig in each of the Mitral sector to allow a minimum of 50% of the gas to escape. To do so, he must use his special vehicle, able to install the drilling rig, positioning them in the right place for each one of the 18 sectors of Mitral. The cover art by Steinar Lund portraits the arid and abandoned surface of Mitral, with the large planet Evath in the background and the small twin moon Tricuspid with a particular rhombicuboctahedral shape. In the foreground the second vehicle that we could drive on Mitral, a small airship that can fly across the sectors, but will not be able to place the drilling rigs. 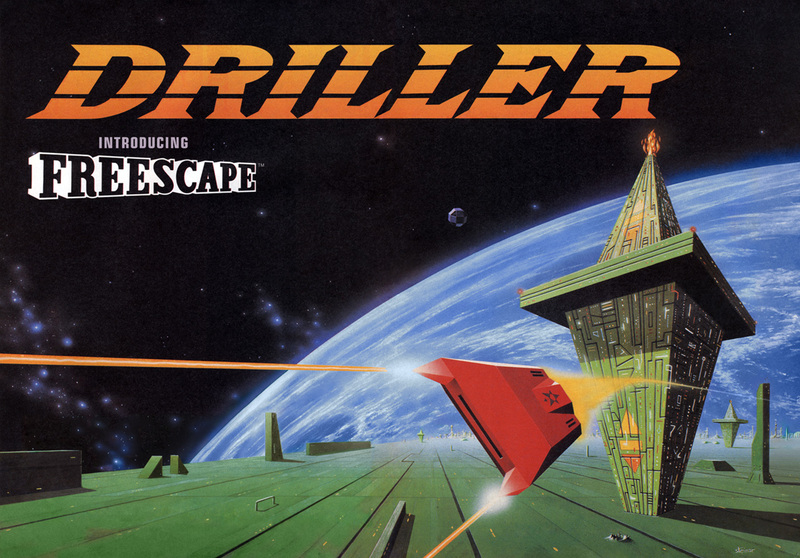 The soundtrack was composed by Matt Gray, the famous author of many other productions of the era for Commodore 64. 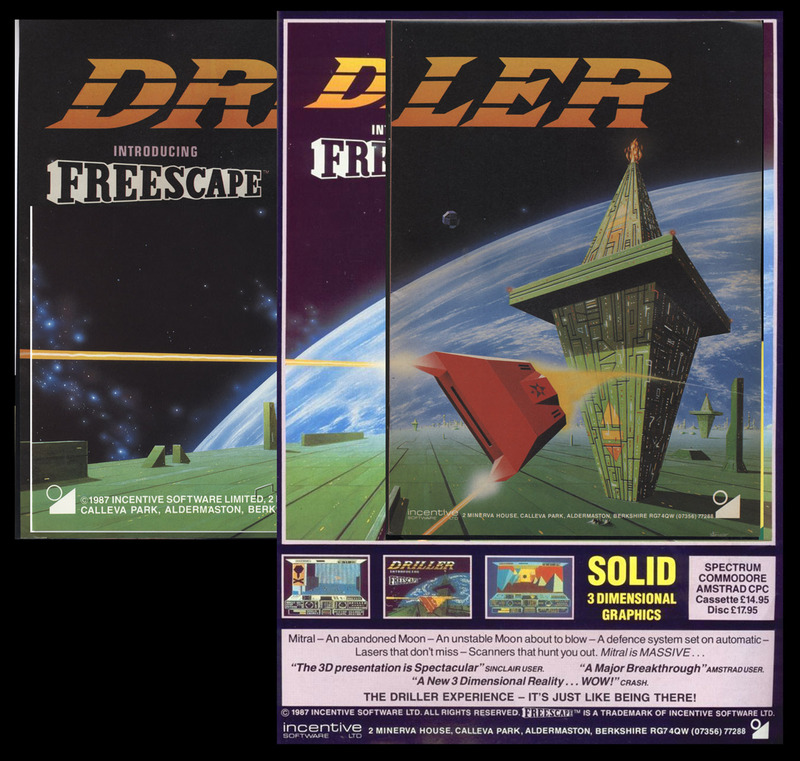 To piece together the original drawing of the cover art, several images of the game box, the game manual, and various advertisements appeared in the magazines of the time, in particular “Computer and Videogames” issue 74 of December 1987. All the third parties trademarks, names, graphics and logos are the properties of their respective owners. Should any trademark, name or logo owner feel not protected in their rights, please contact us as soon as possible for rectification.